Kay Kuebeler lives in Homestead, Florida, USA. Her great-grandparents were John Keenan (b. 30/4/1847, Ireland; d.10/10/1930, Wheeling, West Virginia, USA) and Elizabeth Gamble (b. 28/10/1849, Ireland, d. 22/1/1889, Wheeling, West Virginia). Her grandparents were Thomas J Keenan (1884-1961) and Mabel Bell Barr (1888-1975). 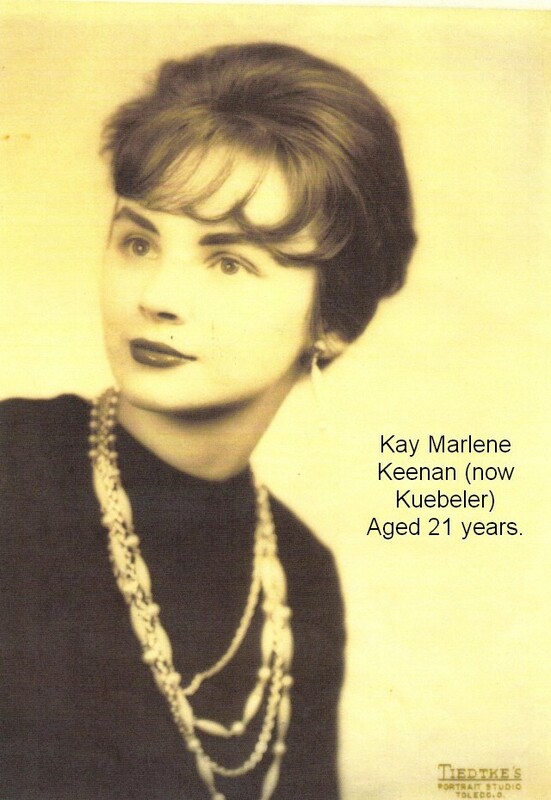 Her parents were Kenneth Hannan Keenan (1913-1960) and Margaret Lorraine Cadaret (1915-2000). Click here to see photographs of Kay. Kay and I have been writing to one another about family history matters for several years. Most recently she has sent me a huge, beautifully and lovingly assembled folder, containing a host of photos, charts, newspaper articles and other material concerning her family and ancestors. It presents a wealth of interesting and valuable information about some of my American cousins. I intend to publish extracts from this material on this site as soon as time permits. Kay has been and continues to be a source of inspiration to me when working on this website. I can't thank her enough. To visit Kay's own website about her USA Keenan Family, click HERE. Kay has also supplied a lot of photos of her family to www3.familyoldphotos.com. Click	HERE and then search the site for Keenan. "My great grandparents (Daniel Keenan and Elizabeth Wallace Keenan lived in the Glenone/Tyanee area. During a visit to Ireland, I discovered their graves in the Church of Ireland graveyard in Innisrush. They had three children. John (b. 1847 d. 1933), who was my grandfather, Isabella and Mary. John came to America as a youth and settled in West Virginia. " "In order to have a go at answering this question, I have assumed that you and Kay Kuebler are from the same family “line”. In other words, I assume that you are both descendants of John Keenan, b.1847 d.1930, who married Elizabeth Gamble (b.1849) in Wheeling, West Virginia, USA, in 1872. I understand that this John Keenan was son of Daniel Keenan (d.1872) and Elizabeth Wallace of Tyanee, Northern Ireland. My guess is that this Daniel Keenan (d.1872) was a brother of Henry John Keenan (b.1808). So, as my great-grandfather was a son of Henry John Keenan (b.1808), it appears that our great-great-grandfathers were brothers." "Don’t know if you have these or not. David G Keenan’s obit was in the Wheeling News Register April 6, 1948. 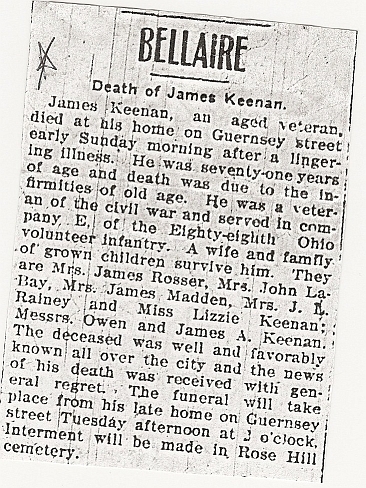 James Keenan’s obit was in Wheeling News Register February 4, 1907. Mrs. Hoyt’s great grand daughter sent them to me. She does a lot of genealogy and visits the Ohio County Library in Wheeling. She lives in Moundsville." Note by Peter Keenan: It appears that this James Keenan was born in Ireland. The American Civil War went from 1861 to 1865.